Durapower Products Pipe and Hose Repair Kit and Patch Kit provide quick, easy, and permanent "on the spot" repair of almost any type of pipe, hose, or flat surface. Durapower Products is the leader in fiberglass technology and provide proven and effective products for professional trades, industrial companies, and the do-it-yourself person. Our products provide permanent repair, but are also effective for eliminating down time while waiting for replacement parts, scheduled maintenance, or simply keeping on hand as an emergency repair kit. 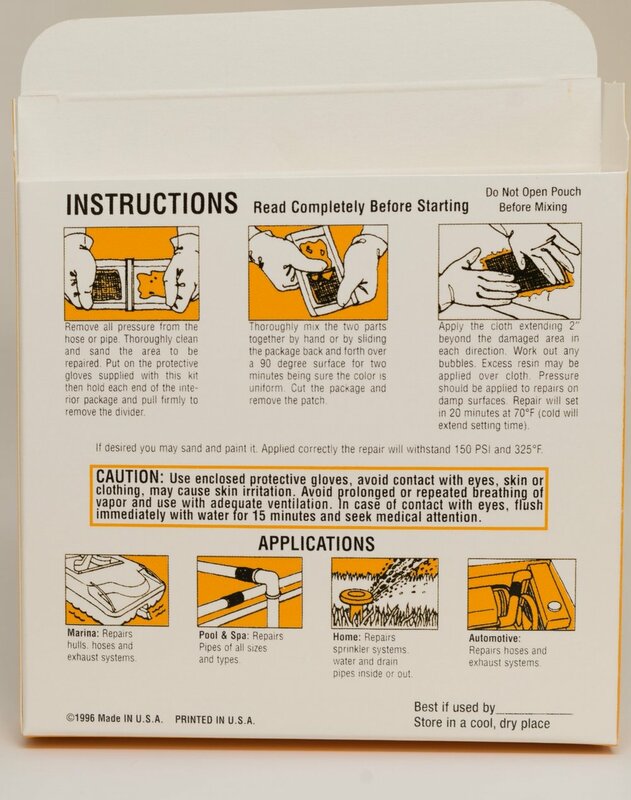 The Pipe and Hose Repair Kit uses a special resin impregnated fiberglass tape sealed in a foil pouch. Its design facilitates repairs in hard to reach areas such as inside walls, and can be applied to connectors and fittings without the need to cut pipes. Once opened, the tape is simply wrapped around any surface and will set as hard as steel in about 30 minutes, even under water! Everything You Need, All In One Kit. The Patch Kit is designed for flat surfaces such as tanks, containers, boat hulls, or large diameter pipes. No measuring and no mess, just blend the components together in the package and apply to any clean surface. Feel free to send us an email by filling out the form!